Aloha! The idyllic setting of this amazing top-floor penthouse offers breathtaking views of the ocean and is the perfect getaway for two couples or friends who family traveling together. The unit comprises of two bedrooms, two full bathrooms and comfortably accommodates up to four guests. While staying at Waikoloa Beach Resort you will be entitled to resort guest rates for golf at the Beach Course or the Kings Course. The furnishings within the property are to a very high standard and modern in design, and is sprawled out over 1,230 square feet. 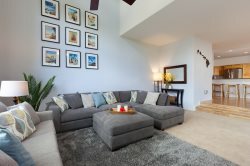 The living room is spacious and offers a large flat screen TV and slider doors that opens onto a wrap-around dining lanai. Open and inviting, the living room flows into the dining and kitchen area making entertaining a breeze. The gourmet kitchen comes fully-equipped with stainless-steel appliances and all the cookware needed to create a delicious meal. The breakfast bar seating provides a casual dining space with seats for three, and joins the dining area with a beautiful dining table that seats up to six people. You will find romance, luxury and relaxation in the master en-suite that offers a king-sized bed, flat screen TV, and opens to the wrap-around lanai. The master bathroom features dual sinks and a beautiful walk-in shower. The guest bedroom is near the main bathroom and offers a queen-size bed and a flat screen TV. The enchanting Waikoloa salt water and heated pool blends perfectly in the swaying palm trees and offers lounge chairs and tables. Also included is; basic cookware, dishware, drinkware, coffee maker, blender, washer/dryer, hairdryer, bed and bath linens, iron, air-conditioning, wireless service, basic cable TV. There are beach towels for your use. Enjoy the white sand beach of Anaeho'omalu Bay is about a 10-minute walk away which offers many water-sports from this picturesque beach along with the very popular restaurant Lava Lava Beach Club. Water sports include windsurfing, swimming, sailing, snorkeling, glass-bottom boat, dive trips, whale watching trips, etc. We also offer full concierge service to make your trip perfect. Easy to work with, no issues. A GREAT place and a GREAT experience. This was a very relaxing place to be with amazing views and an easy walk to the beach. The kitchen is beautiful with everything we needed. Appliances are great and easy to use. The water and ice dispenser got a lot of use while we would relax on the balcony and watch the sun go down. This top floor unit provides a great view of the sunset and the night sky. It also has a neat view of rock garden formed long ago by volcanic action, this island has such a neat history. A great location with an easy drive to some of the most amazing beaches and snorkeling. Also within driving distance of the mountain visitors center (at 9000 feet in elevation) provides an amazing view of the stars, better than anything I have ever seen before. The furnishings are high quality and comfortable, the rooms are spacious, a great place to relax and recharge. I am planning to return to this unit in the future. Excellent property for a great relaxing vacation. They were very friendly and very helpful. It was a delightful, relaxing, getaway.